This is the thread for Summit Guilds, or any others on our Server who couldn't make it to post 1) A brief history/summary of their guild and 2) current goals/RP directions/storylines you'd like other guilds to be aware of! I will be posting a few of those who I received, but feel free to add your own! If Any of your Guilds have a site other than Guildnet, kindly PM to me or include in your post! The Synovian Empire is the governing body of a world known as Synovia, the planet shares similar traits to Alderaan mixed with Hoth and Ilum in the more uncivilized areas. The government is similar in structure to that of the Empire itself: led by a single Emperor that delegates responsibilities of governing the planet to a Council of 12 individuals. Sith and Jedi alike that have wavered in their allegiance to their orders have found Synovia as a neutral ground, often abandoning their philosophies in favor of the teachings provided by the veteran Force users that live on the planet. So far, Synovia has stayed neutral in the war over their opinions regarding both the Republic and the Empire without seeking to expand their territories. OOC info: the guild is pretty casual, not many are heavy RPers and there are a few members in the guild that don't want to RP at all. However, I feel as if getting them involved would help more with the activity side of things, and perhaps rekindle some interest in RPing again. The FMMC was created after our original guild, Theta Company, was disbanded. After the disbanding, The four founders of the guild actually created the guild, with the four families of the four founders representing the FMMC. We're pretty much just surviving in the galaxy, taking mission to mission, and looking for work, actually. Jedi Custodum is a heavy RP guild founded for the express purpose of facilitating Jedi RP. It is intended to act as a "home base" for Jedi characters, be they Guardian, Sentinel, Sage, or Shadow, as well as a platform for organising Jedi-related events and activities. As card-carrying members of the Jedi Order, Custodum (the word is plural!) are expected to be representative of the interests and behaviours of iconic Jedi Knights. Although opinions on the Jedi Code and the Jedi Council vary greatly, the Jedi Custodum generally uphold the values of the Code and the authority of the Council, and ultimately answer to Grandmaster Satele Shan. Please be aware that characters dabbling in the Dark Side of the Force or romantic relationships are not in keeping with the guild's theme, and are generally not permitted outside of very particular RP circumstances. There is nothing wrong with RP involving either of the above, but being an IC member of Custodum generally means the character is a paragon of the Jedi Way, or in the process of striving to be. Custodum is happy to be involved in on-going RP relating to the above types of characters, but such characters are generally not members of Custodum themselves." The Wraiths are a shadow military unit of the Republic, operating as a secret project directly known only to the Select Senate Intelligence Committee and certain elements within SIS (but functioning separately from them). Founded to serve as a vanguard against hidden threats and able to act with greater stealth and freedom than the Grand Army of the Republic, the Wraiths consist of Marines, Naval and Jedi (orthodox and grey) branches under the command of General Lagrigo. Their Navy, commanded by Captain Caben Wysan consists of a colorful merger of naval and privateer elements, which support their Flagship the Fallen Angel and her elite fighter squadrons. Colonel Allissande commands the Marines and Jedi Master Thylria the Wraiths Enclave Council governing Force users. When on missions often conceal themselves as Mercenaries or Privateers to avoid blowing their cover, but have top security clearances and influence when needed. Recent Plots: Pursing Sith kidnapping our Padawans in major engagements across multiple worlds (including the sister of a senior Jedi, Daress), Undercover investigations of traitors killing soldiers on Hoth, Multiple underworld operations to thwart Imperial Intel and secret weapons projects on Nar Shaddaa, defection of a Sith Lady who has become our Director of Intelligence, Larger actions in Battle of Anchorhead and the Fall of Contention Point. Basic story same but depends on faction. Both follow Path of Revan. Is not a Revanite group but much older. They began as Sith acolytes on Korriban during Revan and Malak’s earlier empire. 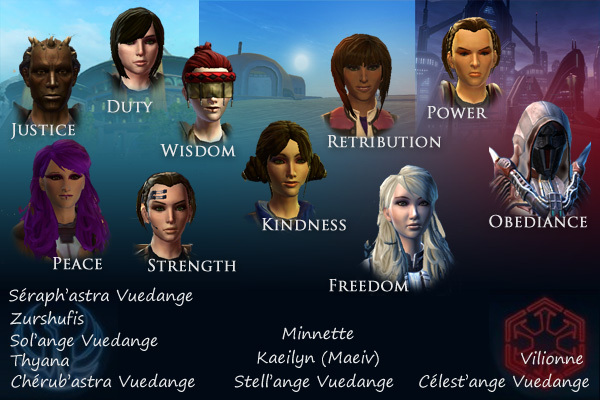 Over past 250 years they have evolved while seeking knowledge for Revan. Builds off of Darth Kreia's belief that Revan was a Sith Lord was for the Republic, did everything to strengthen (even in hitting weak links) for coming dangers. The Republic-side order follows principals of Revan, fights for preservation and prosperity of Republic by any-means necessary except turning to the Sith. Their Force users consider themselves grey/using Dark Side but not corrupting selves/avoiding selfishness. Both groups view New Revanites as upstarts who don’t know anything. Had 200+ years to learn of Revan. Current objectives are Erradicating (or converting) rest of Revanites. Equilibrium is a small OOC guild mostly made up of real life friends, though we all met in game. We have no IC existence, in terms of any organisation we represent. In game, we're Light Equilibrium pub side and Dark Equilibrium imp side. Our officers are Seraphie (GM) and Kezie. What geoups us is our friendship and our desire to both RP and bring RP to the community. We have no guild story, but rather arcs or stories that we're running and that generally anyone in the community is welcome to join. Less of a single organization as a series of plotlines involving various gangs and factions Siv_Wysan fleshed out during some recent stories. One center, The Greasy Hutt (Gorvan-Kremmel's Smuggler's Cove/Tat Stronghold) is an "anything goes" dive bar at the edge of the Dune Sea in the Outlaws Den of Tatooine, recently expanding into something on an Anarchist's Free Tatooine Collective. Siv is planning a series of more RP's here in the future. Its owner, gruff but good-humored veteran arms smuggler Gorvan is also the secret backer of the Anchorhead Vigilantees, who grew out of the cities Militia/Police form but are a secret independence movement beneath the militia's public cooperation with the Republic Garrison. Twin Suns activities in Republic and Imperial territory have been fleshed out, including the secretive Supreme Boss Feraedin Drell (who started as an NPC but is now a PC) and some of the other gangs (Black Sun, Exchange, rogue Hutts) coming into stories. Folks with ideas to add are welcome! "Jedi Business, I'll handle it." The New Ossus Enclave is not a radical re-interpretation of the Jedi Order, instead a farther reaching arm. These men and women are not independent of the Jedi High Council. Originally overseen by Enclave Grand Master Kiryka Suriam, the Enclave itself seeks to train Padawans to Knights, to offer Knights the experience they'll one day need as a Master, and to allow Masters to pass their teachings onto the next generation. Other sections include Miscellani, and the 119th Torrent Battalion, the military contingent, all three sects under the command of Grand Master Maryck Vos, referred to as the Ossus Battlegroup collectively. Corellian Insurrectionists: A rabble rouser in the Corell system has had a connection to a Senate bombing many months ago. The situation seemed handled after he helped find the true culprits, yet he remains, undermining Republic efforts in the system. Public Dissatisfaction: Public opinion of the Jedi seems to decrease with every day. It's only a matter of time until someone asks "Why are they given so much autonomy?" Revenge of a Dead Man: A long vanquished enemy of the Ossus Battlegroup seems to have made a stunning recovery from drowning in his Star Destroyer. While he was alive, he made their extermination his M.O. With recent attacks, it appears nothing has changed. The Imperial Reformation is a direct response to crippling infighting that has plagued the Empire, created to promote unity, and set a somewhat experimental example for the Empire to follow. Whilst not directly belonging to any spheres, the group draws its support from a more united, consolidated Empire under Darth Marr, taking inspiration from his outlooks and teachings. The Reformation tries to remain officially neutral during Sith on Sith conflict, but, does hold an amount of Inquisitorious power to intervene and try and find a better solution. At it's core, the Reformation has acknowledged that without change, the Empire is doomed. This is about survival. Attached to the Reformation, and rapidly becoming a sort of sub guild of it's own, is the military contingent. Comprising of the 2nd Battalion, 1st Regiment, 1st Imperial Marine Division and the 603rd Tactical Fighter/Commando wing, the Reformation likewise offers (alarmingly popular) Imperial Military RP in the form of a Rifle Battalion, Fighter Wing and Navy Special Forces. The largest Imperial ground offensive since Corellia, some 5.5 million Imperial troops have launched attacks on a heavily fortified Republic defensive line on Balmorra, with the goal of breaking through to the planes, and securing a number of important cities. Catering to: Anyone would like simply like to RP the war part of the Star Wars. Seeing as how Bioware seems to have forgotten that the galaxy's biggest war is currently in full swing, we've taken it upon ourselves to give our soldier characters something to do! How to get involved: Message me if you'd like to get involved directly, but, the setting is open to personal writings or other plots. The Reformation has recently been made aware of a series of strange, ancient ruins on a dormant world that have been giving off a signal...time to follow the breadcrumbs! Currently still in the planning stages. Prince Numair has been plotting. More on this in a few months! For @Armeria and those who don't know, moderators of GuildNet groups can add Arcs to their groups! Furthermore each person has a personal OOC note sections and IC Plot section on their profiles. The Alderaanian Enclave is a metaguild: anyone in any guild, with a Jedi charactee, can chose to belong to it. There is no corresponding in game guild. Seraphie's Yavin stronghold is about to be opened up to the public, with keys given to any wanting them to be able to visit the enclave's school complex on Alderaan, on land donated by the Vel-Korr family, in the more equatorial area of Alderaan, built upon some ancient Jedi ruins. The enclave was founded by the former throne's Jedi Advisor, in the wake of the liberation from the Empire and later departure of Alderaan from the Republic, in hopes of protecting Jedi families and preserving Alderaan's unique Jedi traditions and educational legacy in the dark times. The enclave is loyal to the High Council on Tython, but maintains some unique traditions, including a community of very spiritual monastic Jedi and dispensations allowed for marriage in some cases. The children are trained with less removal from their families and a small university-town has grown up around the enclave. One doesn't have to be Alderaanian to join, but only have some relationship with and commitment to the enclave as a religious community. The Dark Network (also known by its official designation: Imperial Intelligence Directive 616) is a cabal within the Sith Empire that was created to facilitate the spread of Imperial influence within the galaxy. Typically, this is done via the overt or covert manipulation and application of information. so as to produce outcomes on the socio-political landscape that are deemed 'ultimately favorable' to the perspective of the Sith Empire. The focus is on a long-term gain for Sith philosophy and doctrine, and by extension, Imperial philosophy and doctrine. Comprised of the power-bases of several influential Sith lords and Imperial officials, as well as elements of the galactic underworld, the Network operates in the shadows to ensure its goals are met for the benefit of all of its members, and ultimately the Empire as a whole. Operation: Snowstorm - An anti-Network created by the Republic, Operation Snowstorm has been harrying Imperial operations across the galaxy with a focus on counteracting the Dark Network's spread. Pahrah: The Dark Network has also taken control of a world in the Unknown Regions known as Pahrah, that is host to a strange race of creatures... and a wealth of cortosis ore. Propaganda: Mella, Orphan of the Empire: An Echani blade dancer fleeing agents of the Republic has bequeathed the care of Mella, her 4-year-old niece, to Elym, the Lieutenant-Governor of Zythia, who plans to employ the girl - and her story - in a propaganda campaign. Coronation of Darth Hazek/Imprisonment of Darth Thrax: Following a betrayal and a disastrous strike against a Republic world, Darth Thrax has been captured and has been taken into the custody of the SIS, where he has been moved to a secret facility outside of the reach of his agents. Meanwhile, following the completion of a successful Kaggath ritual against Darth Phrixos, Lord Hazek ascends to the mantle of Darth himself and prepares to take his master's place as the head of Directive 616. Very little is known of the Wardens of the Sky; at best, they are a myth, the whispers of engineers and starship crew of the Force-users who traverse the space lanes and keep them safe from pirates bounty hunters, Imperials and other thugs. Are they even an organised group? Do they have a leader? Do they fight with lightsabres, vibroblades or their bare hands? Often thy are said to pose as nonchalant passengers or a ships crew, often take up positions as mechanics and pilots. All that is certainly known about them, is they believe everyone has a right to safe travels and you can't take the sky from them. Open arcs: None, currently. Something I will be picking up in the near future. My drawing was not of a hat. It was of a boa constrictor digesting an elephant. Just a quick bump as some may be viewing this eve. GuildNet link is up above, which is the option we're encouraging all Guilds to make a profile on long-term (even if you don't plan to use all the other areas of this site). The Republic and the Sith Empire are at war. Each side grabbing at worlds, heedless to those caught in the crossfire, and throwing increasingly destructive forces at each other. Worlds burn and lives are irreversibly changed in the aftermath. Both sides are so set on beating the other that they don't see, or don't care, what the consequences might be. In the midst of all this, fringe worlds and independent allies have fallen prey to raiders, corrupt politicians seizing power, and force users seeking to carve their own empire. Aid only comes if the systems are "strategically placed" leaving many worlds to languish in corruption and ruin. The Blue Star Alliance fights ostensibly for the republic, but has been known to forge alliances in the Empire. We contract to independent worlds in need of protection and aid in any way we can. In return, we are granted repairs, weapons, new recruits, safe havens, whatever can be spared. We do not stand idle as worlds are ravaged and burned by the greed and wars of others. We are the shining light in the dark. We are the Blue Star Alliance and we will fight for those without voices. The Phantom Legion is an an offshoot organization created at the request of the Sith Lord Asmodeus Halcyon, who petitioned the Dark Council personally for the right. Ostensibly, the group was created to conscript and train sentients of all races and social standing to be a stronger backbone for the Empire. However, in secret, the group is expanding its own power base, garnering their own loyalties, as they believe the Empire as it stands is destined to fail, and prepare to survive the coming fall and perhaps to even take its place. While loyal to the Empire up to a point, the Phantom Legion follows their own ends. The Order of Mercy is a covert team sanctioned by the Republic Senate for the extraction of POWs from behind enemy lines. Led by the Jedi Michael Halcyon, the team is given the right to conscript forces from within the Republic as well as the unaffiliated, for the purpose of keeping the Republic's secrets protected and its citizens free. The group has a shaky truce established with the Phantom Legion, due to each group being headed up by a member of the Halcyon clan. Thus both sides have friends and family on opposite sides of the conflict, and the two groups will often work together when their goals align. However, while the Legion is carefully wary of its affiliation with the Empire, the Order of Mercy is staunchly loyal to the Republic, and carefully overseen by the Senate.